Shangrila, Playa del Carmen – Nearly completed complex in a great area of Playa’s New 5th Avenue! There is a new development on Calle 38 just near Avenida Newly released preconstruction prices, Condominiums Downtown Playa del Carmen. 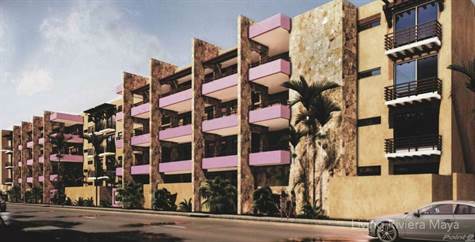 Great investment opportunity in Playa del Carmen, also a great place to live or retire. These brand new Playa del Carmen condominiums for sale are a wonderful option! With 2 spacious bedrooms, plenty of closet space and 2 full bathrooms these condominiums are comfortable for full time or vacation living. Do you prefer ground floor convenience or a penthouse with private rooftop terrace complete with built-in furniture, granite counter tops built in sink, jacuzzi, and half-bath? Whichever you choose, you are sure to get an excellent return on your investment. As Playa del Carmen continues to grow, the downtown area is becoming an even more desirable location for its convenience to schools, stores, services, the trendy 5th Avenue and of course, the world famous sparkling white sand beaches! Not only is this new construction packed with amenities it also has property management and a rental pool available for those who choose to use their unit as a vacation rental. The condos offer full-service concierge, WiFi internet service in all common areas, 24-hour security and the entire building is constructed for easy accessibility for wheelchairs. Call today for more information about this fantastic new condominium development in downtown Playa del Carmen. They just started digging the dirt away. Get in now and have the most to choose from, take advantage of starting prices. From 235,000 to 265,000. The units will be between 1,055 and 1,134 sqft plus balconies and terraces.